hi vis, hi viz, high visibility, safety vests, traffic safety, Children’s, Boys and Girls reflective safety vests, Price includes free shipping, People and Pet Reflective Safety Vests People, Children’s reflective safety vests People, Spot N Trots Distinctive protective outerwear for people and their pets are recommended by Safety Personal and Veterinarians throughout the world Spot N Trot Reflective Safety Vest for people are manufactured by Spector Apparel in the USA. Spot N Trot offers you a maximum protection by using highly reflective and visible products. These are the same high level performance materials used for road construction and traffic control safety vests worldwide. Spector Apparel the manufacturer has an extensive track record of producing the highest level Quality and performance products in the United States. The same materials used by the Spot N Trots lines are used in making police, security, construction companies, and large government highway divisions safety vests. Their reflective materials are extremely bright at night and along with the bright fabrics are also highly visible during the day light hours. The Spot N Trot line by Spector Apparel is designed and manufactured for men, women, children and Pets who want the very best in safety outerwear. Their designers and manufacturers have spent many years defining and perfecting the necessary performance of clothing for everyday use. Function, comfort and durability are paramount while complementing the entire line with fashion appeal and fun. No matter what the season, Spot N Trots will keep you comfortable and safe. Their nylon provides wind resistance and dry with its water repellant shell. 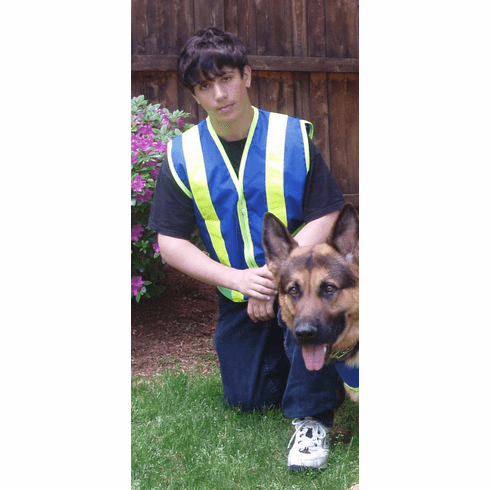 Boys and Girls, Children’s reflective safety vests, Price includes free shipping, Spot N Trots Distinctive protective outerwear for people and their pets are recommended by Safety Personal and Veterinarians throughout the world Spot N Trot Reflective Safety Vest for people are manufactured by Spector Apparel in the USA. Spot N Trot offers you a maximum protection by using highly reflective and visible products. These are the same high level performance materials used for road construction and traffic control safety vests worldwide. Spector Apparel the manufacturer has an extensive track record of producing the highest level Quality and performance products in the United States. The same materials used by the Spot N Trots lines are used in making police, security, construction companies, and large government highway divisions safety vests. Their reflective materials are extremely bright at night and along with the bright fabrics are also highly visible during the day light hours. The Spot N Trot line by Spector Apparel is designed and manufactured for men, women, children and Pets who want the very best in safety outerwear. Their designers and manufacturers have spent many years defining and perfecting the necessary performance of clothing for everyday use. Function, comfort and durability are paramount while complementing the entire line with fashion appeal and fun. No matter what the season, Spot N Trots will keep you comfortable and safe. Their nylon provides wind resistance and dry with its water repellant shell. hi vis, hi viz, high visibility, safety vests, traffic safety, People and Pet Reflective Safety Vests (Size XS S M L) "Orange Nylon" "Orange Mesh"